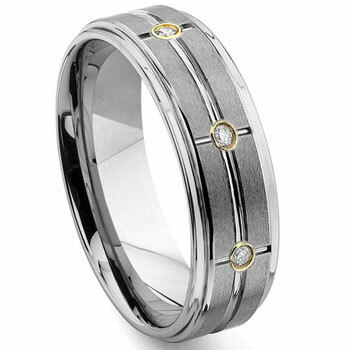 This classy men's wedding band is the TitaniumKay.com tungsten matrix gold diamond wedding band. 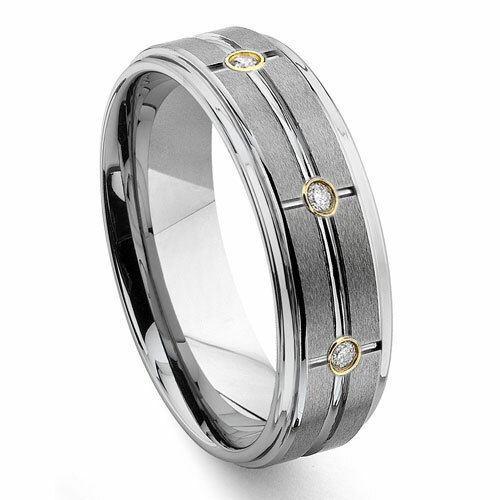 Made of high polish tungsten along the sides of the ring and a satin finish on the surface, with 3 GH Color 0.17 Carat total weight diamonds mounted in 14K gold bezels. The matrix design on the surface of the ring with the 3 diamonds and gold bezels exudes a sense of sophistication and refinement. The wedding band is 8mm thick and several popular sizes to select from. While the ring looks almost too nice to wear everyday it can be worn safely to work or play, being made of tungsten there is no need to worry about the ring crushing, bending, breaking, or even scratching. The metal used is so hard it is used in a variety of applications that require superior strength to work such as the space shuttle. Further all of the men's wedding bands for sale on the TitaniumKay.com website are covered by a 100% lifetime warranty. Shop today for yours but hurry, they do not stay in stock for very long. I was referred to your site by one of my co-workers to purchase a ring for my fiance for the wedding. Your selection is AWESOME! We found the ring he wanted and placed the order. It was received very quick and is absolutely beautiful! He is very pleased! I have since referred so many people to your site! Awesome prices, excellent quality and easy to use website!!!! The ring is absolutely gorgeous! It is exactly, if not more beautiful, as shown. The sizing is dead on so do not order a half size up or down. The Ring is shiny, the diamonds are crystal clear, and most importantly the ring is very heavy! It is going to look beautiful on my husband-to be's finger on the day of our wedding. I was pleased with the very speedy delivery of this ring. I knew I was buying a beautiful piece of jewlry, but I was extremly overwhelmed by the seeing the actual beauty and magnificance of this ring. The online picture does not do it justice. I am very satisfied with my selection and with the service I received.